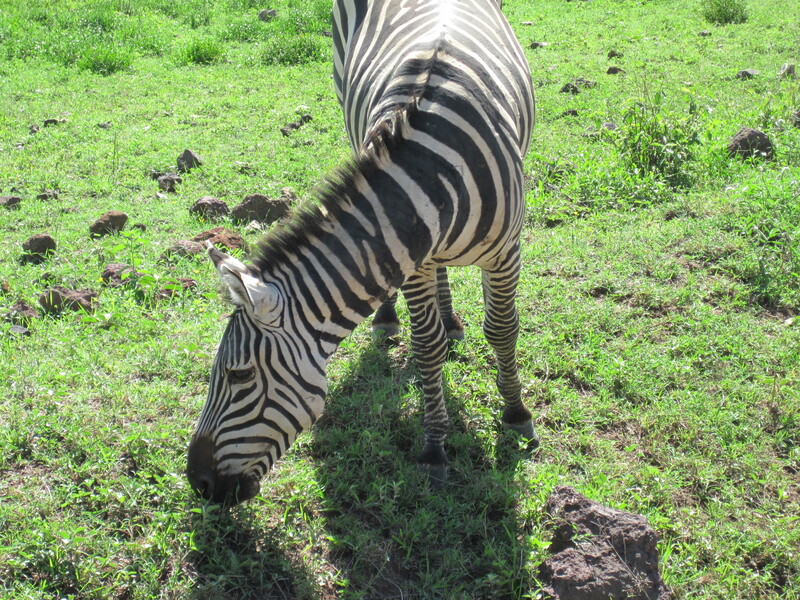 So, yes, this is another post about my safari travels around Tanzania….. what can I say, I “heart” animals, and really saw SO many of them, so I have tons to say on the subject!! And lots of pictures to share, which is why this will be a 2 part post. This region is very rich in wildlife, so rather than overlook any of our friends of the animal kingdom or post a single ridiculously long post, you’ll be getting installments on this one. 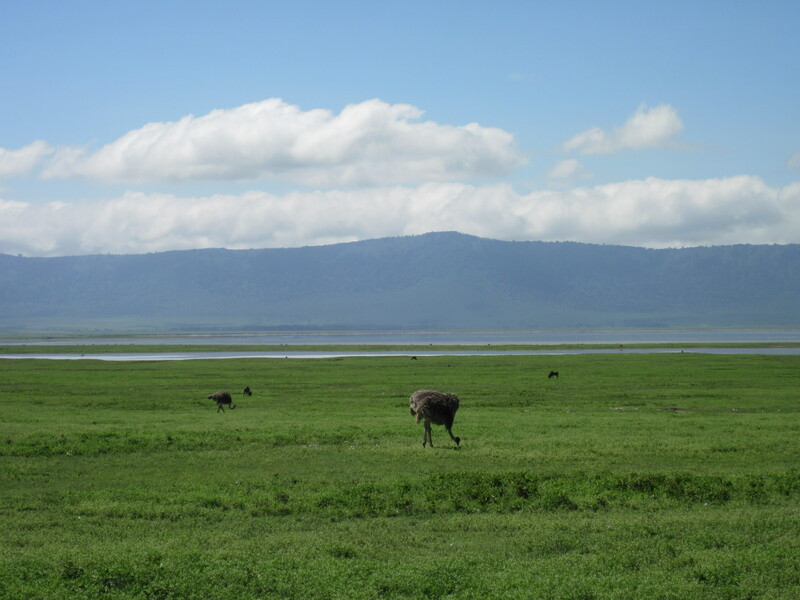 Surprisingly, despite the Ngorongoro Conservation area and the Serengeti being right next to each other, you can expect to see some different animals in the different areas. 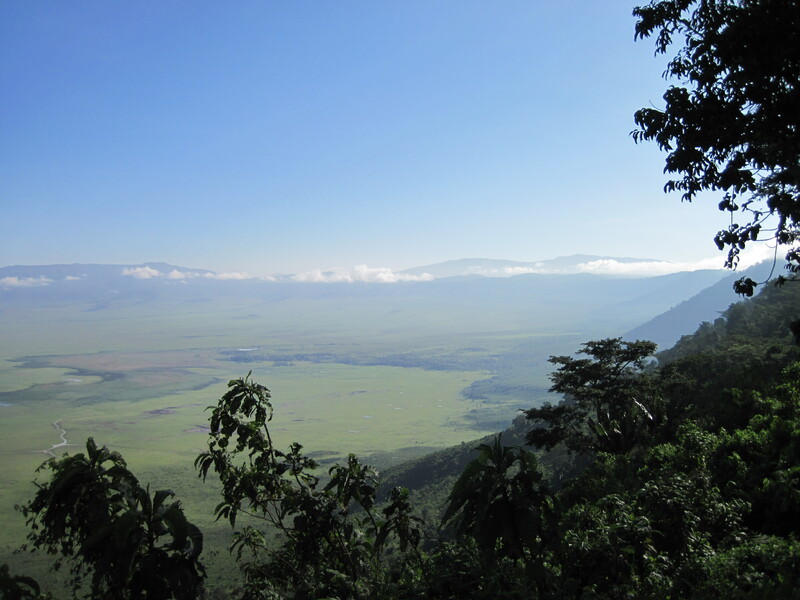 For example, our driver explained that D was definitely going to lose the “what animal will we see first” bet, as she had picked Impala and apparently there are no Impala in the Ngorongoro Crater. Right by the side of the road - I love that the little ones are brown! The first animal we came across was a Zebra, and, in fact, there was a whole herd of them right by the road, who seemed really not disturbed at all by our safari vehicle as we passed on by, or as we stopped to be their paparazzi. We were in a pop-top safari truck, and I opted to sit in the front. One word of advice if you ever find yourself with the choice of whether to sit in the front or back of one of these vehicles: if you sit in the front, make sure you’re wearing sunscreen because the shade that covers the back passengers when the top is popped up doesn’t reach you in the front…… I wish that had occurred to me as this day went on! But no worries, I didn’t get TOO sunburned…… just a little bit….. but back to the tale at hand. 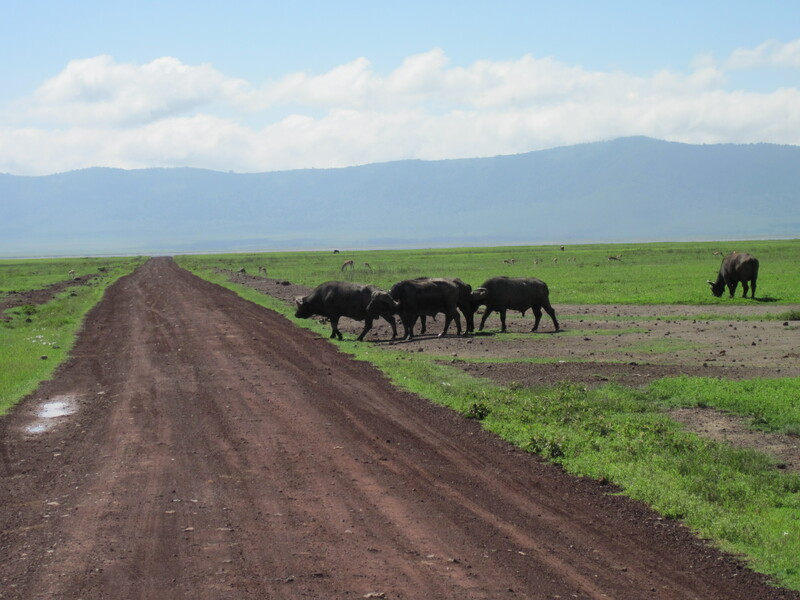 The next animals to literally cross our path were the Buffalos. These big animals look slow and harmless enough to those of us who are used to farm-raised horses or Jersey cows hanging around, but do not let their generally passive demeanor to fool you: this is one dangerous animal that,when angered, can be quite deadly. 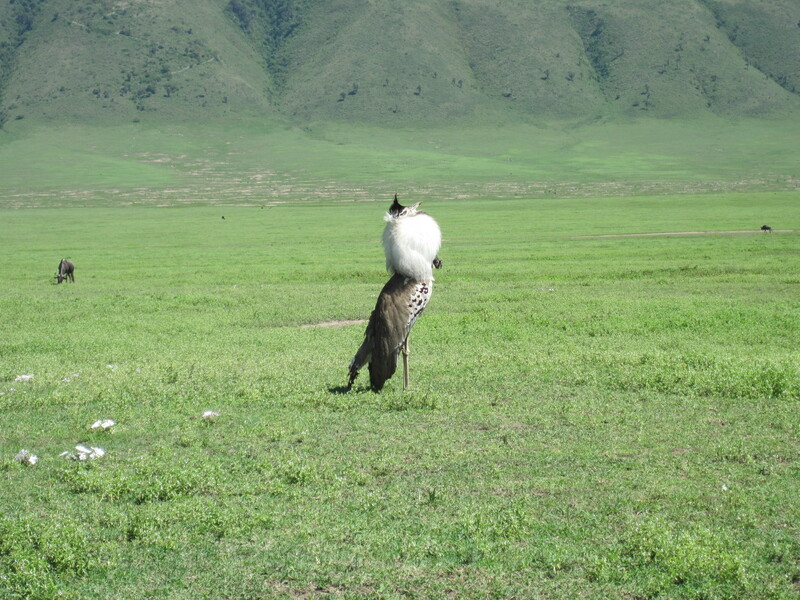 In fact, many believe them to be the most dangerous animals in the Serengeti/Ngorongoro region – at least for humans. I know I certainly wouldn’t ever want to take one on. This group seemed to travel as a unit, and when one or two of the buffalo straggled behind, either due to poor health or advanced age – I couldn’t tell which – the rest of the group paused at the other side of the road and looked back as if to say “c’mon, slow poke. We’ll wait, but get a move on!” I’ll say this for these big brutes: they really do seem to have each others’ backs!! 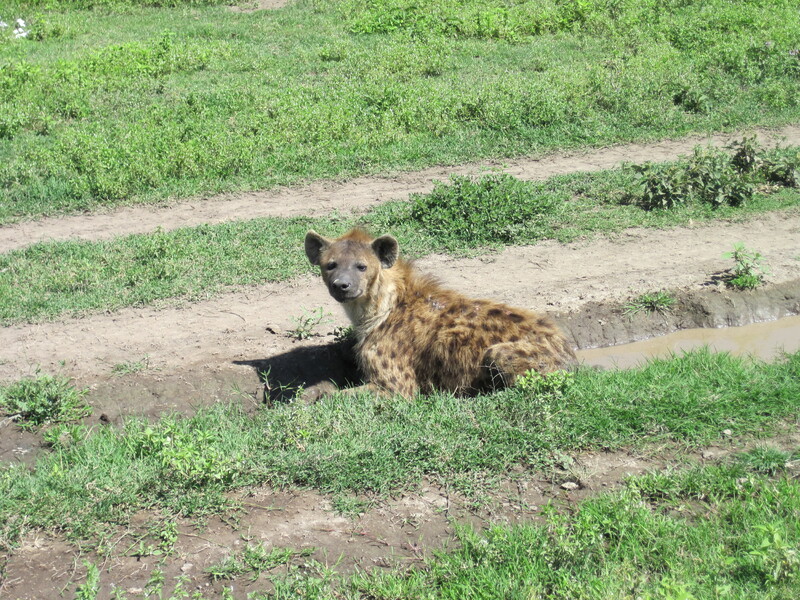 The next animal we encountered was the hyena. We got pretty up close and personal with this one as he stared us down. But he was feeling pretty lazy, and the most we saw him move was to get over to a puddle of water he could lie in to cool off. He’d lift his head, turn and look at us for a minute, then lay down so that his neck could get moistened by the puddle and he could just cool down. As scraggly and patchy though it may look, I’m sure that fur coat of his feels pretty hot in the 100 degree heat of a typical day in the Ngorongoro Crater! 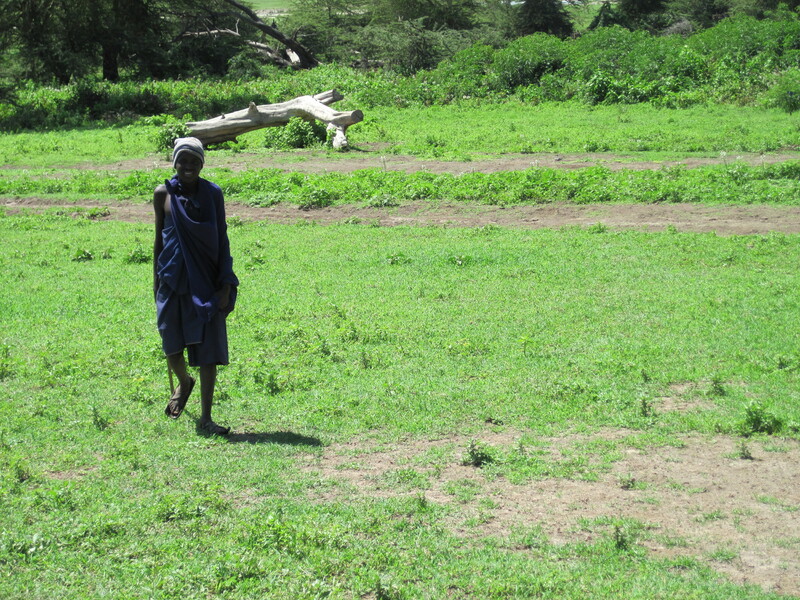 So when hunger isn’t driving him to hunt, can you really blame him for trying to find a little relief from the scorching heat of the African sun? 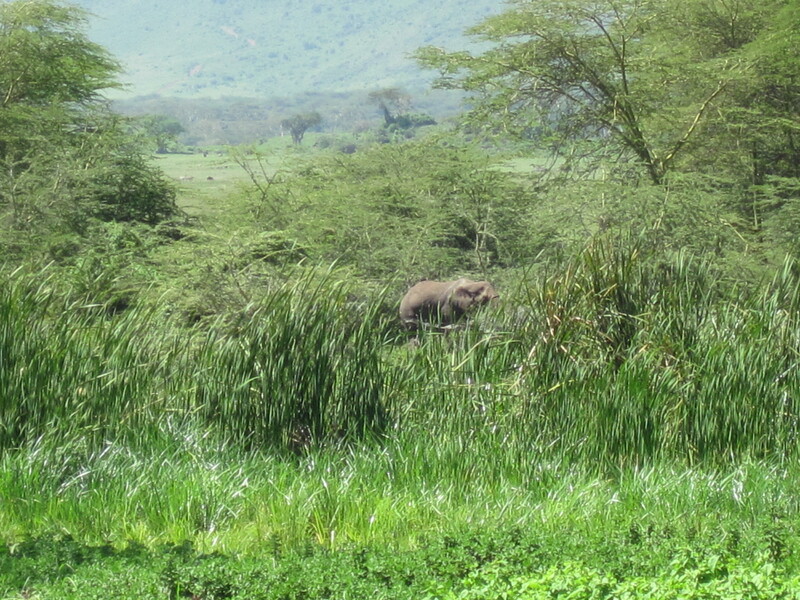 In fact, most of the animals we encountered weren’t too active due to the heat. 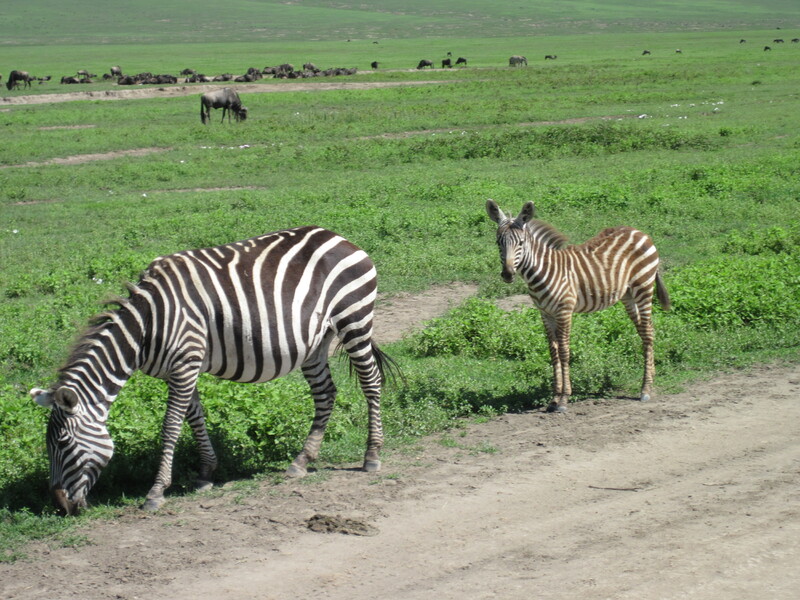 The one exception to this was the baby zebras, that seemed to be the only ones willing to frolic around in the heat. While the Wildebeest and adult Zebra looked on, the young ones ran around and played. At first, every time I tried to film it they’d stop, but finally I got this one to frolic on video! How can you not smile when you watch this?? Next up on our animal hit parade come the silly looking birds. You might think I’m just referring to the ostriches or flamingos that we encountered (though, sadly, I didn’t get close enough to the flamingos to have pictures – they were across the lake), but I’m also referring to this strange-looking bird we saw but have no idea what type it is. It looks kind of like a skinny lady wearing a fur stole or feather boa around her neck. Anyone who knows what kind of bird this is, please feel free to tell me/us in a comment! All I know is that it was fascinating to look at in person, and got a lot of stares from our vehicle. OK, well, since this is just part I of a 2 part post, I’ll leave the rest of the animals for the next post, as I’m running out of time and steam right now…… part 2 will follow soon!